Sugarloaf Crafts takes over the MoCo Fairgrounds in Gaithersburg April 12-14! A fun-filled weekend of handmade shopping with a family-friendly festival atmosphere. Shop from 250+ of America's most gifted emerging and established artisans. The latest styles in jewelry, fashion, fine art & photography, home decor, sculpture, and SO much more - on display and for SALE 3 days only! Which artists bring you to Sugarloaf year after year? What brand-new talents at the show have you most excited? Search our artist directory for old favorites and new finds! 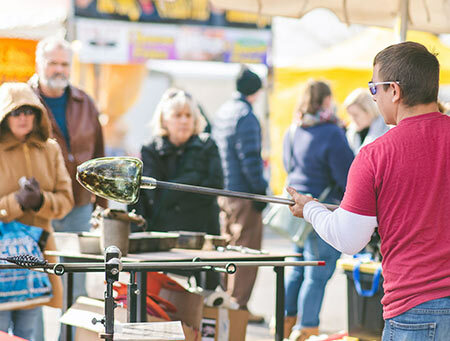 Feast your eyes on the flames from Philip Valencia's forge during his fantastically-entertaining glassblowing demonstration. Shop the best in handmade artistry this weekend at Gaithersburg! 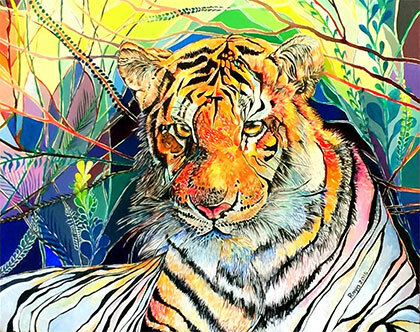 Pairing her passion for painting with her positive attitude, fine artist Raya Salman brings her vibrant paintings to Sugarloaf for the first time this weekend. Greet all our latest talent and say hello to your favorites at the show! Local fashion designer Maritza Newman styles her handpainted silk in her Silver Spring studio. Meet Maritza in person alongside 250+ talented exhibitors in Gaithersburg! Sugarloaf's Shopping Guide features our artists' newest work and exclusive offers not available anywhere else. Check it out! We're looking forward to another unforgettable festival in Gaithersburg; we hope you'll join us! Follow us on Facebook, Instagram and Twitter for all things @SugarloafCrafts. See you this weekend! Older PostSugarloaf Crafts This Weekend at Dulles Expo - 20% Off Tickets Today! + FREE Painting Class!